Aldon 4023-07 For long-term switch lockout. Grips base of switch point and base of running rail. 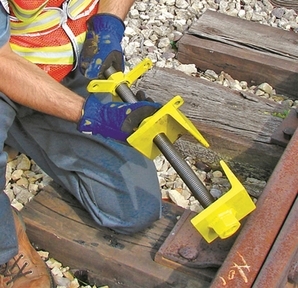 Fine screw threads and 3-point handle bring switch point tight against main rail to within 1/32"
Can be padlocked without any loss of tightness. #4124-319, padlock is sold separately.